Ao Nang which was initially a backpacker spot is now the most westernized beach in Krabi. It is rapidly becoming a great tourist attraction site. Ao Nang beach is certainly one of the best beaches in Thailand. This place is advanced in terms of hotels, accommodation, and other services. It is also a great place for exploring Krabi as well as to experience good foods, visit wonderful nearby beaches and look around souvenirs shops. Follow the post and find the best things to do in Ao Nang Beach. Originally called Thai Su-san Hoi which is translated to “Seashell Graveyard. It is located around 7km west of Ao Nang and with 40 million old shellfish that are flattened and give an appearance of concrete. A museum and a huge gift shop are also available here, however, the entry fees are high here for tourist which is up to 200 baht, whereas it is just 20 baht for the locals. Quite unfair? Frankly, if you are not a geology student it's not worth spending this much money over here. 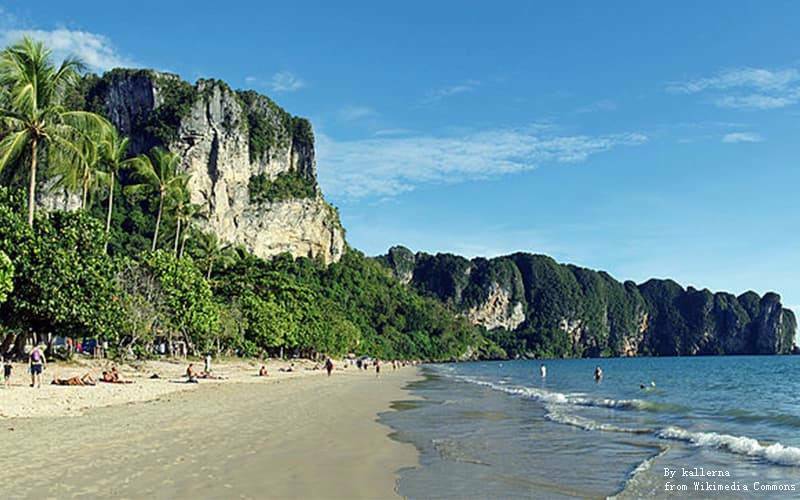 It is one of the most pleasing beaches which is present the western tip of Ao Nang. When the tides are low you can even walk up and visit other limestones islands. Remember, the beach is filled with jellyfish so before putting your feet inside, ask the people around if its “jellyfish season”. This is a great beach near Ao Nang. You can travel here by kayak or longboat. It is much cleaner than beaches at Ao Nang and Nopparat Thara. There are a resort and hotels on the beach and some caves that are adventurous and worth exploring. However, one of the greatest problem here is that if you are planning to visit the place in off-season, the travel through longtail boat is quiet frustrating as the riders demands 800 baht for crossing, so either you will have to wait for enough passenger, an exhausting task or pay the entire some of 800 baht by yourself! There are various tiny but beautiful beaches around Ao Nang. Some of which, example Phi Phi Islands Tour, Hong Island, and 4 Island Tour can be traveled by speed boot or longtail boat. Other amazing nearby islands are Lading Island, Pakbia Island, Chicken Island, Tup Island, Poda Island, Rai Island, and Daeng island. Although snorkeling is only possible at Hong Island and Chicken Island, also you will only find small fishes of limited species here. One of the activities here is rock climbing. This can be arranged by Ao Nang agencies who will offer lunch, transfer and unlimited climbing or you can simply roam around in Rai Leh or Ton Sai after going through the introductory course. There are many dive shops around this place which offer dive courses and trips in almost similar prices. However, if you search around you can find some great seasonal bargains. Areas included in the scuba trips are the site of King Cruiser Wreck, Phi Phi Marine National Park, local islands in Ao Nang Bay, and Shark Point Marine Sanctuary. If you feel more adventurous and you wish to view marine life you can have a one-day trip to safari through speedboat Hin Daeng and Hin Muang where you can see whale sharks. You can also do cavern diving at 5 islands and view manta rays. Keep in mind that some of the nicest diving sites are crowded in peak season i.e. late-December to early-January. Jungle ziplining is a cool adventurous thing you can do since there are many jungles nearby with high canopies in Krabi. You can also find many 7/11s where they will have premade meals and sandwiches which can be reheated for you. Family marts are also present. Both 7/11s and family mart have food, alcohol, drinks, cigarettes, medicine like paracetamol etc. You will notice in Ao Nang outside some restaurants there will be a sign saying “Clean food, good taste” all these restaurants offer food in boiled water and have good tasting food at reasonable prices. All these restaurants are certified. However, keep in mind that the food here costs more than that in Krabi, the main course itself costs around 150 baht and if you wish to order sea food they are even more costly (starting price 250 baht). Recently, many restaurants have employed Indian staff, so you can get Indian food too. You will also find one person who is employed to lure customers inside the restaurant. Drinks are ample, and you will find them in bars like Planet Ao Nang, present in the beach front and Last Fishermans present down towards Rai Leh-end. Both the bars are good for sunset view as well. Another important beach is Center Point, near Burger King; it has a wide range of bars catering. If you have other preferences like listening to live music, KR bar, and Rocky Bar are your spots! There are other bars as well located along dirt road including Football Bar, Chilli Bar, and Spaghetti House. These bars are famous for the beautiful view of the cliff and offer a relaxed environment. There are several modes of traveling in Ao Nang, for instance, you can take Tuk-tuks which charge roughly around 30 baht/person, but it can even reach up to 60 baht/ person. Other means include songthaews (a shared taxi), the fares start from 10 baht and can vary depending upon the distance traveled. You can visit Shell beach through Songthaews, some even take you to Krabi town. You can even rent a motorbike if you desire to explore areas outside Ao Nang. You can rent a bike for around 200-300 baht for 24 hours and visit several shops outside Ao Nang. If you wish to stay in a resort overnight or you want to take trips around the province, you should consider renting a car in Krabi. Car rentals are cheaper than taxi costs. You can easily rent a car from Krabi airport desk. Krabi is not over crowded like other provinces in Thai so it's easier to ride cars here and the google maps can take you wherever you desire.